-Some of the courses on the menu were repeats from last month’s “Chef’s Tasting Menu” (which is a little more expensive). 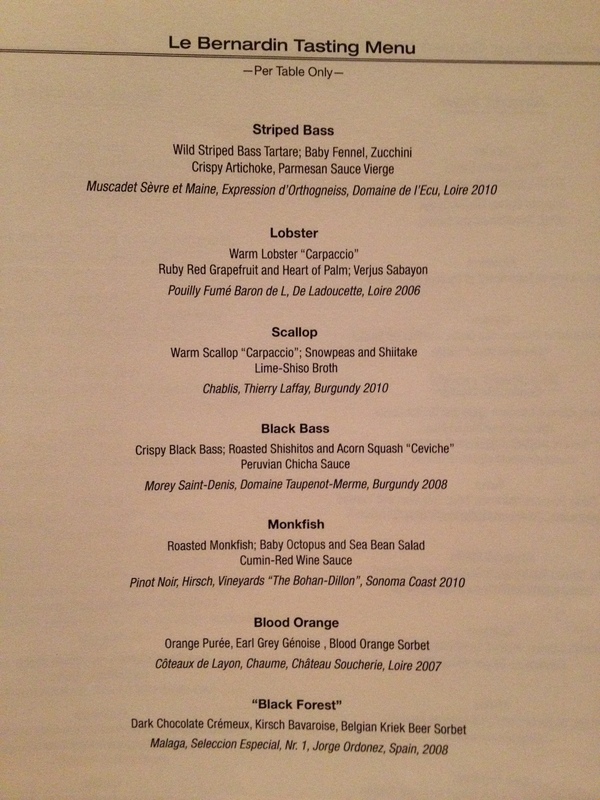 I’m guessing that some of the favorites from the Chef’s Tasting end up as part of the next month’s Le Bernardin Tasting. – Restaurants are like people: the chef’s pedigree informs the quality of the cuisine. 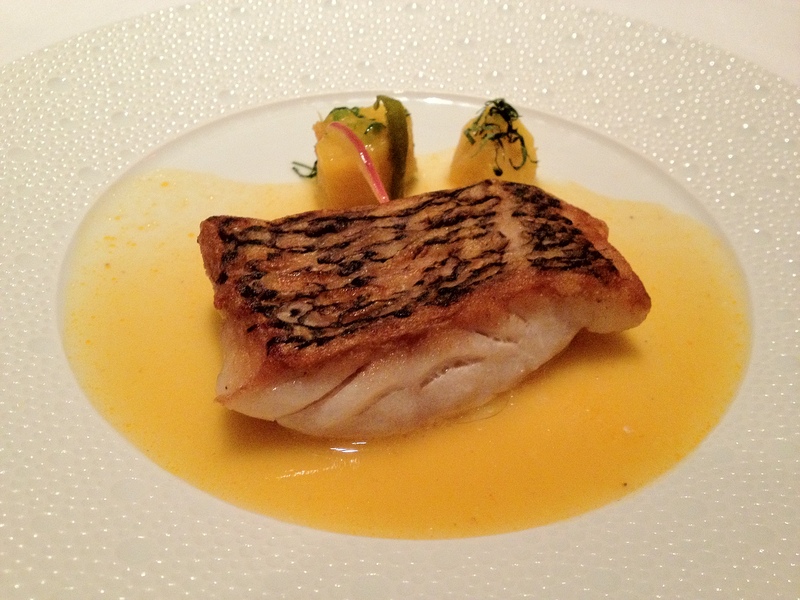 In this case, Eric Ripert’s experience as chef poissonnier under Robuchon is undeniable in the renowned seafood preparations at Le Bern. Add to this his tour (heh) at La Tour D’Argent, and you have the culinary equivalent of an Oxbridge man. – Ripert unabashedly characterizes his flagship restaurant as a “seafood restaurant.” So, although you may request duck or lamb options from the menu, I recommend you don’t. It’s like going to the Musée d’Orsay and not looking at the Impressionists. Monte: I think it’s funny how much Bourdain just ruthlessly makes fun of Ripert. 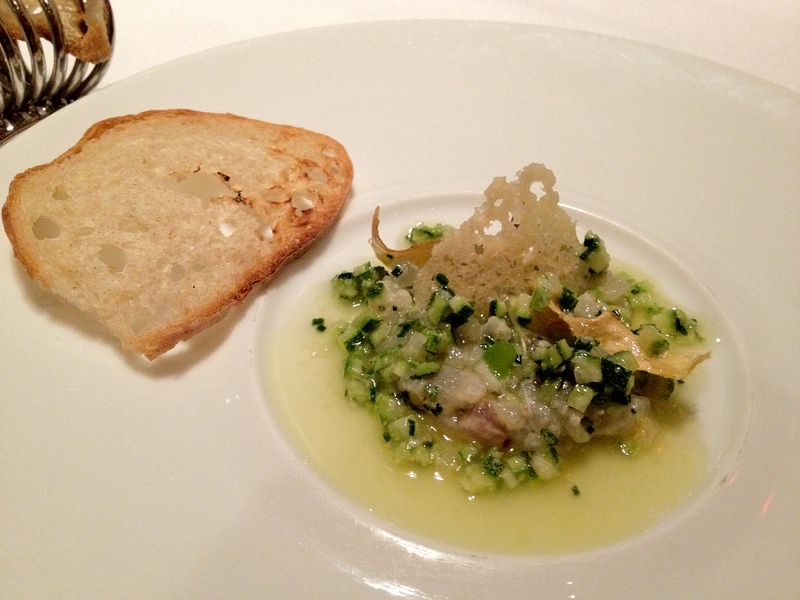 I do think Le Bernardin has delicious seafood – the fish courses here, as a whole, are epic. The sommelier was quite friendly but knowledgeable, and painted a picture of the wines that made me feel like I was traveling throughout Europe, trying French and Italian wines. Middle: Uni with seaweed and tobiko wasabi caviar. Topped with yuzu emulsion. Monte: The amuse came at an awkward time, while we were still holding our menus and trying to decide which menu to pick. My confusion and awkwardness was quickly washed away though as I ate the wonderfully delicious amuses. The gravlax was quite tender and tasty, and I loved the parmesan cauliflower soup. It’s super cold outside and the warmth of the soup, more than just its temperature, was welcoming. Tad: Really? As Monte said, the waiters brought our amuse while we were still holding the menu. We were still deciding whether to take advantage of the great pairings. I was annoyed. 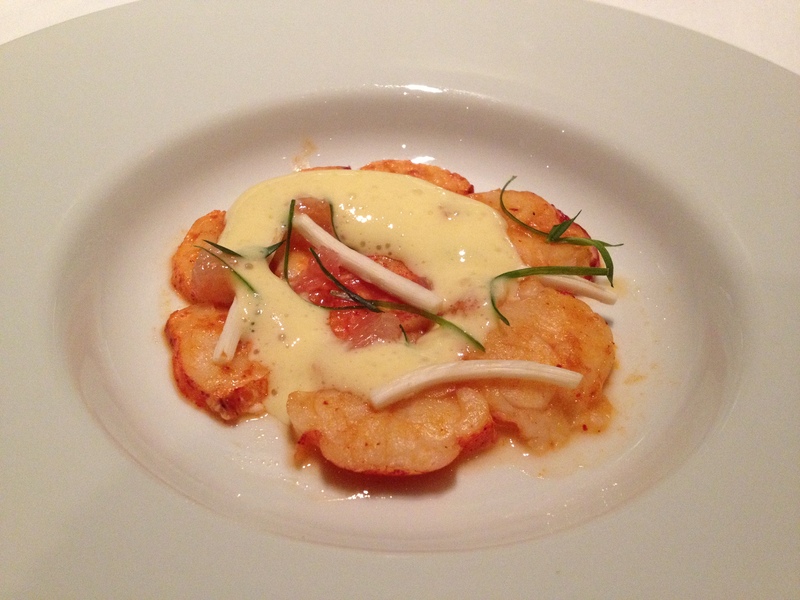 Gravlax was tasty, uni better (and more balanced), but the cauliflower was not that impressive. Offering hot soup overwhelmed by the parmesan tuile on a cold day was effective but hardly inspired. A two star effort at a three star restaurant…le sigh. Tad: I have to be honest. When I saw another parmesan crisp on top of my food, I was getting ready to roll my eyes. But of course it was delicious. Forgive me Monsieur Ripert for doubting you. The fish great by itself, but with the chopped vegetables and delightfully playful sauce, it made me scrape my plate. The toast added some sodium and some crunch; now I understand why some people enjoy potato chips. But honestly, if you’re going to have a potato chip, you should have it with immaculately prepared tartar. Anything else would be uncivilized. Monte: This dish is as light and refreshing as any I’ve ever had. The fish was slightly sweet, and the accompanying elements really added a crunchy and pleasantly acidic bite to the dish. Tad: To be honest, I wasn’t overly impressed with the lobster. The sauce was great, and the dish overall was very well composed. But the lobster itself had a slightly clotted texture, and tasted slightly fishy. At most other restaurants, this would be a fine dish. But one expects more from one of the two highest rated restaurants in the Zagat guide. Just kidding, no one cares about ratings aggregated from a bunch of plebes voting. Monte: I have to agree with Tad and say the lobster didn’t blow me away. It was really good, but not extraordinary. The sabayon was pleasantly creamy and warm but the grapefruit got pretty lost. I wished there was more acid, or more salt – something to help pick up the flavors a little bit. Tad: In contrast to the previous dish, this course was executed perfectly. 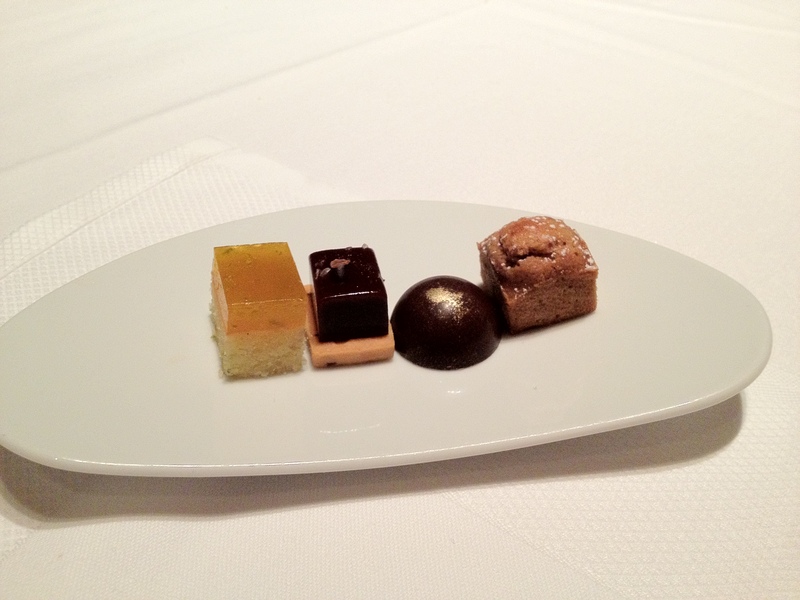 Every single element tasted delicious by itself and in conjunction with the other flavors. The shiso in particular was a standout, and the citrus was also immaculately balanced. Monte: Again, I find myself dumbfounded (Aside: I like Dumbfoundead’s new album) to say that I agree with Tad. 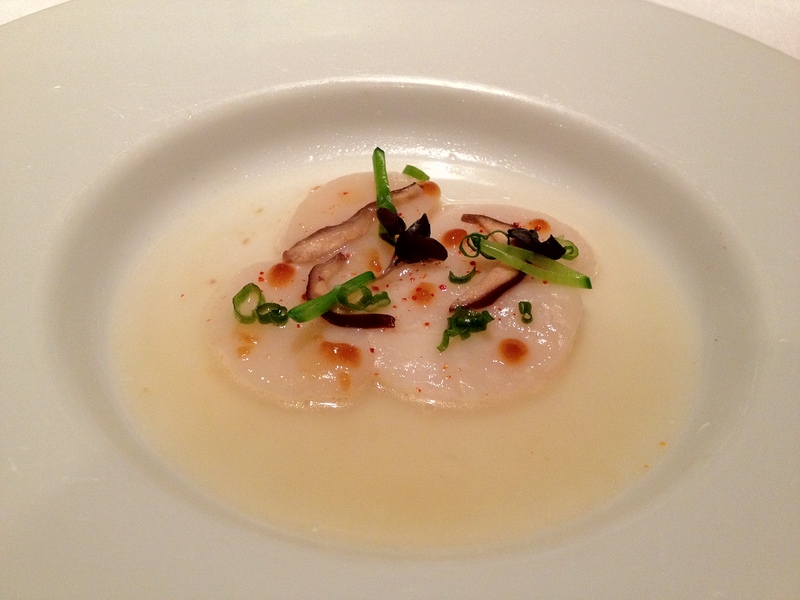 The scallop had an almost creamy texture to it, and its warmth and sweetness made it all a delight to eat. 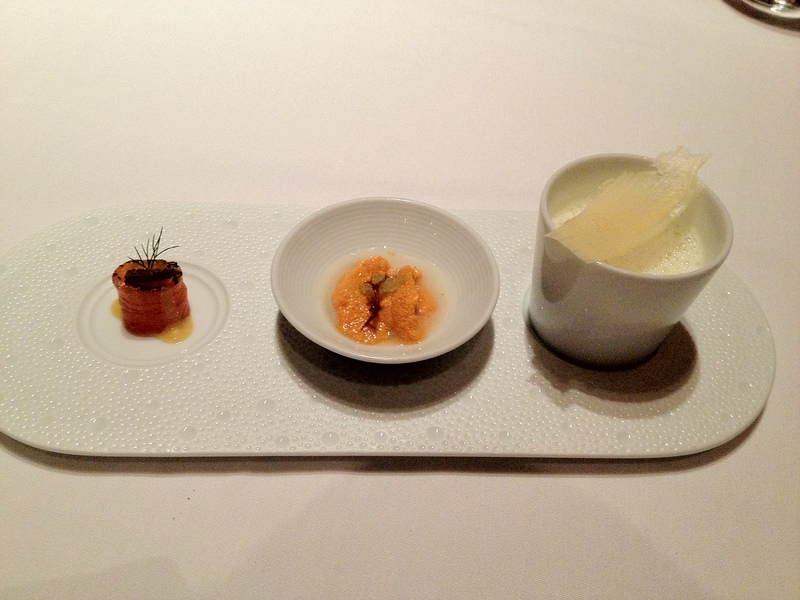 The lime-shiso broth really added a great acidity that the lobster dish was missing. Tad: You may not guess it from the image, but this was a surprisingly light dish. And very clever to have the garnish be a “ceviche” while the main protein was fully (and skillfully) cooked: crisp and sweet. Monte: The skin was absolutely crispy and the sauce and squash both lightened up a dish that already wasn’t as greasy as you’d think. I really enjoyed the sweet and tangy play to this dish. Tad: This dish was really a joy. 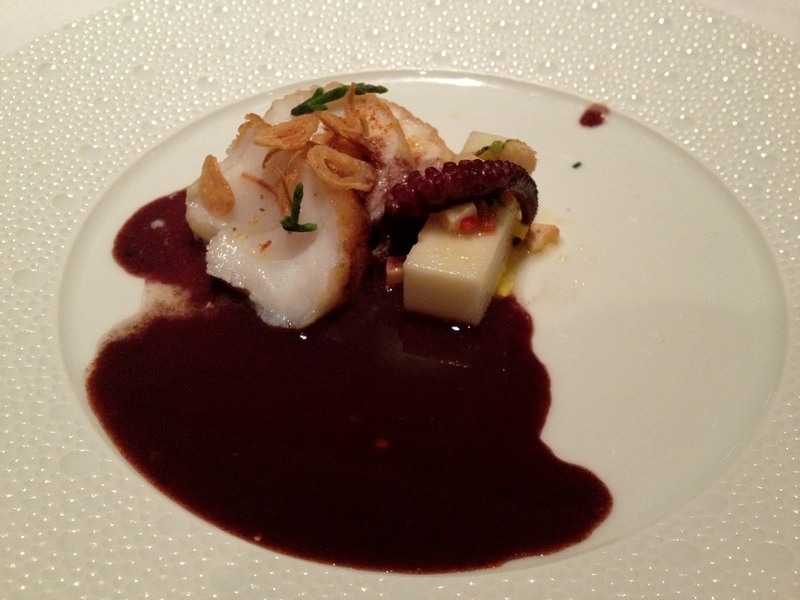 The monk fish and the sea bean salad were the stars, but they were draped in an extremely complex sauce. Rarely do you see cumin used so skillfully that it doesn’t overpower the other elements of a dish. The octopus was slightly disappointing. Reminds me of the time when I got bitten by a mosquito at le Bern. I complained, of course, and maître d’hôtel comped me some alcohol. The charmed life of Tad being what it is, the wine made the meal even better. Not even a mosquito could ruin my gastronomic adventure, so this octopus was really a non-issue. Monte: First off, seriously Tad? The “charmed life”? Are you pitching a new show to Nickelodeon? Your tragic mosquito story aside, the cumin and fish is a combo I’ve never seen before but I thought it worked extremely well. The monkfish became really smokey and, when the meatiness of the fish is taken into account for, really made me forget that I was eating seafood. Really interesting, and really good. Tad: You must have mistaken me for someone who watches television. I have no idea what Nickelodeon is, except that it sounds cheap. Tad: Serviceable dessert. The correct taste sensations were all there, but there wasn’t much Earl Grey flavor (or flavour, in the Queen’s English). Tad: Now this was a much more interesting dessert. Once again, the elements worked well together. 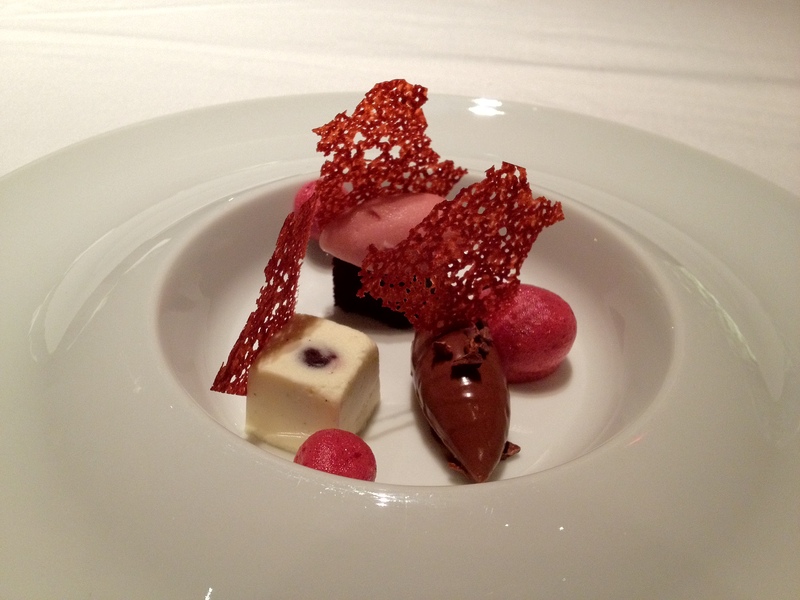 However, one piece, I believe it was the “cake” part of this deconstructed dish, tasted a bit like cough syrup. Which may be good or bad, depending on how much you like cough syrup. It’s like having a bit of Catalan in your French (no offense Eric, I knew you grew up with a lot of Catalan around). Monte: I actually thought this dessert was a bit of a downer. 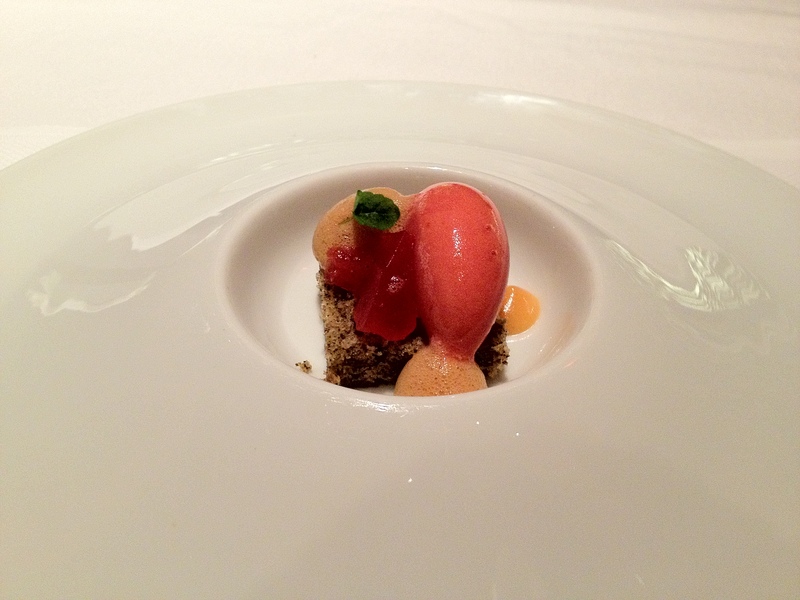 I remember the last time I went to Le Bernardin a year ago, the dessert blew me away. I think this dessert was too disjointed, although it’s probably because I’m not knowledgeable enough about the intricacies that went into the dish. The flavors seemed one-dimensionally just chocolatey or fruity, and the I didn’t get a real texture from anything, other than the texture of ice cream/sorbet. The bavaroise was tiny and I wish there was more of a bite to it. Monte: I’m not sure if I’ve had mignardes that I didn’t like. These certainly didn’t break that trend, with the lemon and pumpkin ones being exceptional standouts. It was a great way to end the meal.